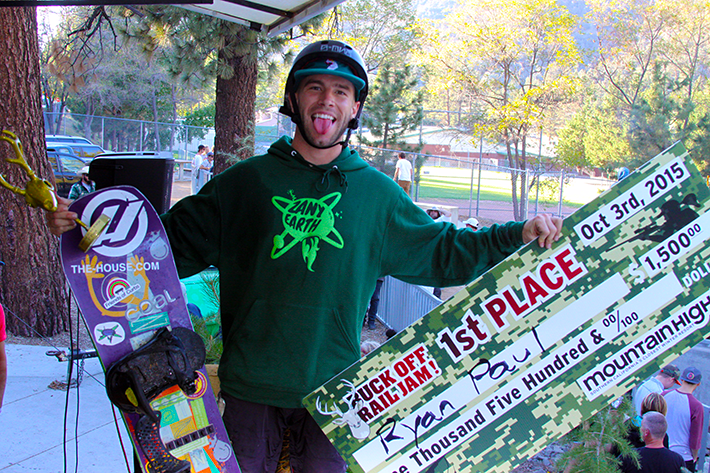 Huge shout out to all the riders and sponsors who came out for this year's 2015 Buck Off Rail Jam & Season Pass Sale. The top buck has been crowned! Congratulations Ryan Paul!! RP threw down a crazy switch frontside 180 front flip to 50-50 on the new Buck Off feature and walked away with $1500 cash, a NeverSummer Snowboard, and prizes from Von Zipper, 32, Neff, Coalatree and Skullcandy. Nipping at his hoofs were last years champ Buzz Holbrook 2nd place, and young gun Draydon Gardner 3rd place. Click here for the 2015 Buck Off Shooting Gallery (photos). Be sure to follow us on Facebook, Instagram, and Twitter for highlights of all the epicness.